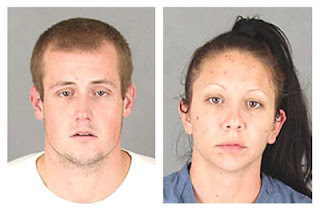 A Murrieta woman and Temecula man were arrested on suspicion of residential burglary after police responded to the report of suspicious people knocking on doors in a Lake Elsinore neighborhood June 17. Emily Jager, 27, and Justin Hart, 26, were booked on charges of residential burglary and possession of burglary tools after their arrest by Riverside County Sheriff's deputies. Officers originally responded to the 45000 block of Promise Road to investigate the report of suspicious activity in the neighborhood. According to a Sheriff's Department news release, one witness reported seeing a male jump a fence into the back yard of a home on Anabelle Street. Officers discovered an open window where they believe a burglary was attempted. A second witness gave officers a description of the vehicle in which the suspects left the area and the suspects were soon detained. Hart and Jager were linked to another recent burglary and they were arrested.